The Village Spirit Center for Community Change and Healing is a housing, services, and community economic development initiative focused on the Black community in Western Washington. Catholic Community Services and Catholic Housing Services have implemented initiatives that focus on what we call “Communities of Concern.” They are the poor and low-wage earners in the Black, urban Native American and Latino/Chicano communities. These segments of our society have suffered greatly from years of marginalization and being excluded in large part from the economic opportunities of this nation and; thereby, unable to break the debilitating cycle of poverty that ensnares them. In these initiatives, we will focus on creating community economic opportunities through the development of affordable housing, transformative services and the authentic promotion of asset acquisition. Being genuine and authentic in the spirit of the village, we will work for the collective wellbeing of the Black community across Western Washington in helping to elevate the social and economic realities of Black/African American families. To build and create sacred living spaces with transformative services, and through joining with others, create wealth through asset acquisition for the Black/African American community in western Washington. Integrity, genuine, authentic, truth, trust, quality, honor, wisdom, creativity, belonging, enduring, faith, justice, security, realistic, determined, healing, joyous, together, compassionate, empathetic. Celebrates the history and contributions of Black people in an authentic and genuine manner. Respects the spiritual, communal, and familial cultural norms and practices of Black people. 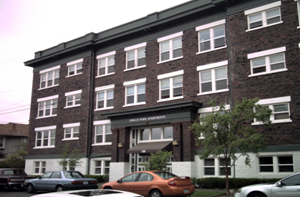 The Spruce Park Apartments provide 45 units of affordable housing in the Central Area of Seattle. Located at 155 21st Ave., Spruce Park Apartments serve families and individuals at 50% or lower of the area median income. In addition, four of the units have been set aside as transitional housing for families that are homeless or at risk of being homeless. For information, call (206) 322-0450 or complete the application and fax it to (206) 328-6637. 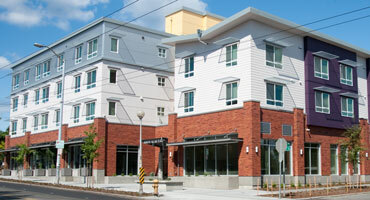 Monica’s Village Place I is 51 units of new, affordable housing in Seattle’s Central Area, at the intersection of 23rd Avenue South and South Main Streets, consisting of one, two, and three bedroom apartments and townhomes. All units are affordable to families making 30% to 50% of the area median household income. The building is oriented around a central courtyard containing a play area for children and a healing/reflection garden. At this time the Monica’s Village Place I application process is closed. Please check back with us at a later date. MVPI has made available to the community a beautiful multipurpose room, including kitchen, sound system, AV equipment and other amenities. All revenue from the room rental goes to supplement Family Services funding for the residents. For more information call 206-323-7130, or download and complete the application and mail to: Brenda Franks, Monica’s Village Place I, 140 23rd Ave. S, Seattle, WA 98144 or fax at (206) 328-2143. Monica’s Village Place I is pleased to announce it was presented an “Excellence in Construction” award by the Associated Builders & Contractors Association of Western Washington. Click here to read the citation of excellence given to RAFN, our General Contractor. To view photo journals of Monica’s Village Place I construction, click below. Our Monica Village Place I is named for Saint Monica, an African laywoman. For more information on St. Monica, click here. Click here to download the Imani Village flyer. For more information, call (206) 737-9240 or complete the pre-application and fax it to (206) 737-9247. The Black Community Impact Alliance is a group of cooperating organizations serving the Black Community in Western Washington. The BCIA focuses on all elements impacting the health and well-being of Black families and the Black Communities in Washington State and pools together diverse networks to raise awareness and create a strong voice for action. The BCIA advocates for resources and direct investment in Black business for the purpose of creating jobs and economic growth. Visit their website here. For housing information, please scroll down and contact individual housing sites at the contact information listed below.